Buried: Kemmel Chateau Military Cemetery, Belgium. 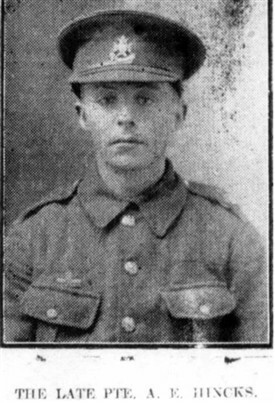 Son of James and Ellen Frary of 30 Ollerton Road, Retford. Arthur worked at the Northern Rubber Works as a pressman. 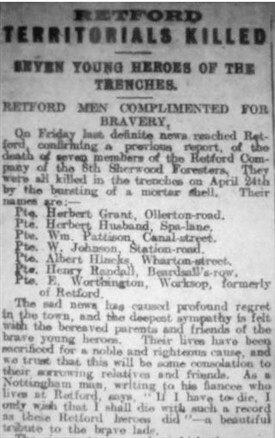 Son of Mr Samuel and Elizabeth Grant of Belvedere Villas, Ollerton Road, Retford. His occupation at the age of 18 was Telegraph Signal lad, G.N. Railways, where his father also worked as an engine driver. Herbert was still employed by G.N. Railways when he enlisted. Albert was the only son of Mr and Mrs Thomas Hinks of 40 Wharton Street, Newtown, Retford. He was employed at W. J Jenkins and Co. Engineering Works and previously by Richmond and Son’s builders and contractors. Whilst in the employment of Richmond builders, he had the honour of laying the first corner stone of Grove Street Bridge. Albert received a slight scalp wound on Easter Sunday and was in hospital a few days before returning to his battalion. Son of George and Martha Hunt, 31 Grove Street, New Balderton, Newark. At the age of 17, he was working as a Servant groom domestic in North Leverton. 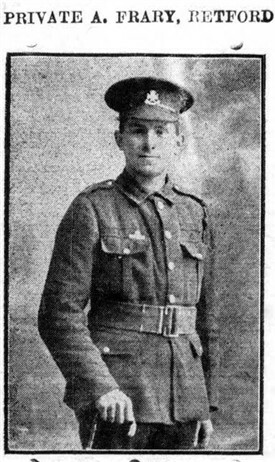 William enlisted on 6 January 1914, giving his address as 5 Station Road, Retford. He was employed at the Northern Rubber Works. Son of Mr Thomas William Worthington, Killamarsh, Yorks. 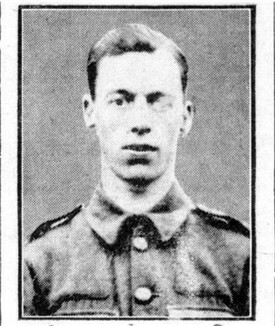 Army records show Ernest enlisting in the Territorials aged 21, living at 50 Wright Wilson Street, Retford. He was a labourer at Bradshaws. Local War Memorial: Retford Market Square and St Swithuns Church, Retford. Son of Mr and Mrs Pattison of 16 Canal Street, Retford. Army records show William in 1909 enlisting in the Territorials, giving the following details: Age 20; occupation of general labourer at the Northern Rubber Works (pressman in the shoe sole department.). He had attended three annual training camps: two at Scarborough and one at Buxton. He had also been an official of Retford Town F.C. Herbert was the youngest son of John and Eliza Husband, of 9 Spa Lane, Carlogate, Retford. At the age of 16 he was working as a millwright labourer. Son of Eli and Mary Randall of 1 Beardsall’s Row, Retford. Army records show Harry enlisting in the Territorials in 1913 at the age of 17, being employed at the Northern Rubber Works. This page was added by Inspire Librarian on 09/03/2016.